It’s the news you’ve been waiting years to hear! Finally we find out the exact details of why the BOM changed two of their best long term sites from cooling trends to warming trends. The massive inexplicable adjustments like these have been discussed on blogs for years. But it was only when Graham Lloyd advised the BOM he would be reporting on this that they finally found time to write three paragraphs on specific stations. Who knew it would be so hard to get answers. We put in a Senate request for an audit of the BOM datasets in 2011. Ken Stewart, Geoff Sherrington, Des Moore, Bill Johnston, and Jennifer Marohasy have also separately been asking the BOM for details about adjustments on specific BOM sites. (I bet Warwick Hughes has too). The BOM has ignored or circumvented all these, refusing to explain why individual stations were adjusted in detail. Graham Lloyd sent the BOM a draft of his feature article for The Australian last Tuesday or Wednesday. The BOM finally replied at 5.30pm on Friday night as the last draft was almost ready to print. I’ve copied the whole BOM response here. I explain below why this is a good response for skeptics. The BOM rely on the usual vague wordy explanation with the unscientific reasoning that homogenization is necessary according to “international literature”. (I guess there is a consensus then, and we all know what that’s worth.) It is the scientific equivalent of saying “we’re experts — trust us”. No one would accept that from a company accountant, why from a scientist? This is the odd case of Amberley minima laid bare. The people living in Ipswich nearby had to wait 70 years to find out that their mornings in 1941 were really almost 2 degrees C colder than what they were told at the time. The marvel of modern science. It’s amazing the planes didn’t crash more often. Translated: So the Amberley thermometer might have secretly moved (and that might be classified) but we are sure it shifted one way or the other. Even though we don’t know where it was before, or how much difference that makes, we can figure out what the thermometers should have been recording in 1941 because of other stations which are hundreds of kilometers away. Even more strange is that the nearest ACORN station is Brisbane Aero, 50km away, which also shows a long term cooling trend. (Paul Homewood has some good graphs on that.) It seems other stations further away are better at recording Amberley temperatures than thermometers at either Amberley or Brisbane. But hey, perhaps the runways were extended at Amberley, perhaps the thermometer moved, and perhaps the RAAF forgot to record the change. It happens. But if so, doesn’t that tell us something very important about the quality of the best 100 temperatures stations that made the grade for the ACORN data set? If the Amberley site is so bad it needs this kind of adjustment due to a theoretical and unrecorded site move, does that mean the rest of the hundreds of thermometer sites around the country are even worse? A cooling trend of -0.35C became a warming trend of +1.73C. Translated: Special thermometers (which we don’t name) show that this site probably moved, even though that wasn’t recorded. If theoretically it used to be on a small hill near the station (it might have been) then those minimums would suddenly drop and so we have accounted for that. The raw minima of Rutherglen and it’s neighbors before “adjustments”. Righto. Spot the warming trend. This is “consistent” with a site that does not need a major warming adjustment. Again, as with Amberley, the message about the ACORN set is the same. If any readers out there happen to have worked at Amberley, or knows someone who did, or have photos of Amberley which may include the white Stephenson Screen Boxes we’d be very happy to hear from you. Likewise Rutherglen or Bourke. We have some good leads on this already. Keen to hear more. Who needs thermometers to know the temperature? The all new world-class ACORN data set is based on imagined site moves. Using this BOM technique — if someone wanted to find a national cooling trend they could spot suspicious step changes “consistent” with unrecorded site moves at other stations. These could be adjusted down with nameless stations anywhere within 500 km (which may or may not show cooling, that doesn’t really matter) . Et Voila. Why do we bother with thermometers? It would be cheaper to record the temperature across Australia from one computer model in Canberra. Where are those long records at Bourke? When it comes to Bourke, Jennifer Marohasy’s point was about the good quality historic data the BOM ignores from before 1910. In response, the BOM ignored the point about how they ignore the data. Like the other sites above, an inhomogeneity was apparently detected through site comparisons, and “may” be related to vegetation changes. How do we know vegetation slowly changed some measurements? Other thermometers at other sites (which may be hundreds of kilometers away) got an average of a slightly different trend — luckily the BOM knows that it’s not because vegetation grew at some of those sites, or wind patterns shifted slightly bringing warmer or cooler air. Blair Trewin explains that up to 40 neighboring weather stations can be used for detecting inhomogeneities and up to 10 can be used for adjustments. 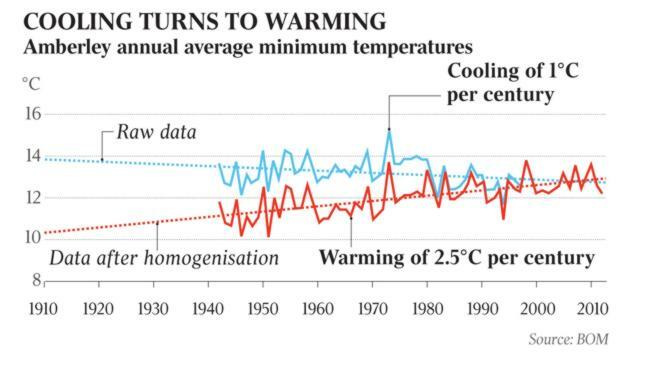 What this means is that temperatures, ever so diligently recorded in the olden days at Bourke by the postmaster, can be change on the basis that it wasn’t so hot at a nearby station that may in fact be many hundreds of kilometres away, even in a different climate zone. Let’s look at that missing 40 years of data. It was recorded with slightly different equipment – a non-standard Stephenson screen or a Glaisher Screen, but both are quality instruments. Hence it would need some adjustment, but it is reasonable and possible to create a long term record. Probably it wouldn’t need as much adjustment to match with modern Stephenson screens as the modern Stephenson screens need to be “adjusted” to match themselves. The pre treatment shows only the Post Office measures. In the post treatment the early Post Office recordings were dropped, and the airport measurements were added in recent times. In all three cases above the BOM tacitly admitted Jennifer Marohasy has the calculations of the trends right, and the massive changes from raw to adjusted really happened. In all three cases the weasel words “likely”, “consistent” and “may” are used with speculative undocumented reasons for changes. How are imagined and unrecorded site moves “consistent” with the definitive certainty of headlines like “hottest ever year”? Next time we’re told it’s another warmest September night in East Where-ever, will we hear that it’s a tenth of a degree warmer, but only according to a bunch of homogenized, adjusted thermometers which may have been 300 km away? Will anyone mention that warmer nights were reported in newspapers of the day, but they were discovered to be wrong 70 years later? Crikey, what if thermometers today are reading too high? Do we need to wait til 2074 to figure out how hot Australia really was in 2014? PS: Wish Jennifer Marohasy a Happy Birthday today, and if you are on the Sunshine Coast, why not do it in person from 5pm at the Sunshine Beach Surf Club tonight! (Head for the beer garden).